EPFO has made it mandatory to quote your UAN (Universal Account Number) on all PF claim forms / representations / complaints / grievance service requests, this is w.e.f 01-Jan-2016. Kindly note that UAN allotment will be done based on your Aadhaar number. This facility has been made available from 16th Nov, 2017 and the EPFO has issued a circular pertaining to this on 21st Nov, 2017. What is Universal Account Number? 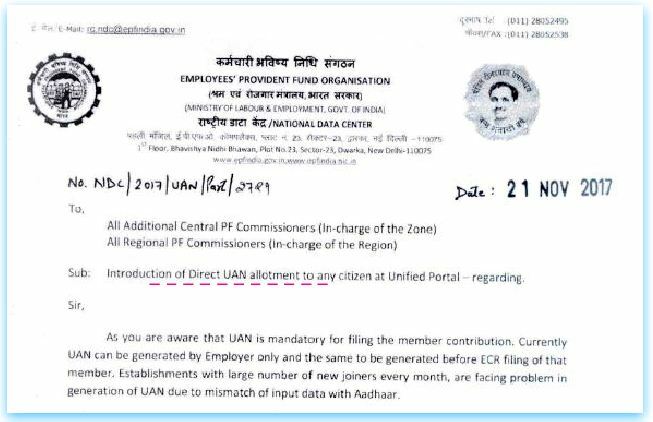 UAN is a unique identification number issued by EPFO to its members. A universal number is generated for each of the PF (Provident Fund) Account Number at EPFO. This UAN will act as an umbrella for the multiple ‘Member Ids’ allotted to the same individual (Employee or EPF Account holder). This number is the key to PF portability and fast PF transfer. How to register & generate EPF UAN online through Aadhaar number? Kindly visit EPFO’s Unified Member Portal. 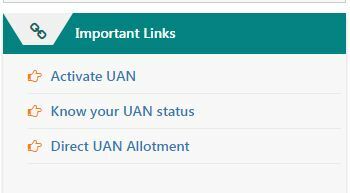 Click on ‘Direct UAN Allotment‘ link under ‘Important Links’. In the next screen, you have to provide your Aadhaar number. Click on ‘Generate OTP’. You will receive an OTP on your mobile number which is linked to your Aadhaar. Kindly enter OTP in the next screen and click on ‘submit’ button. The screen displaying the Basic Details available against your Aadhaar will be opened. Kindly verify your details and enter the requisite data in the mandatory fields provided in the screen. You can then click the Register button after entering the captcha and selecting the box in the disclaimer section. On clicking the “Register” button the UAN will be allotted to you and will be displayed on the screen. Kindly note that one can generate UAN number even if he/she is unemployed or currently not a member of EPF scheme. So, this facility has been made available to everyone. 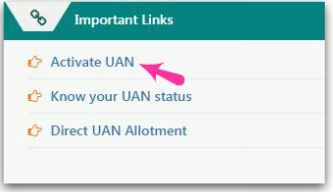 How to active your UAN online? To active UAN number online, you need to have an EPF account number (Member-Id) with you. If you have an old EPF account number, you can use it to activate your UAN number. In case, you join a new organization, you can provide the directly allotted UAN number to your new employer and get it activated with new EPF account number. Click on ‘Activate UAN’ link. You have to provide your UAN number, EPF account number (Member-Id), Aadhaar, PAN, Date of Birth, Mobile number & Email-ID details. Click on ‘get authorization pin’. You will receive a PIN on your mobile number (provided by you in the below screen). Your UAN then gets activated and linked to your EPF account. How is interest calculated on EPF Account – Components & Illustration? How to withdraw EPF online through govt’s UMANG Mobile App? How to get EPF automatically transferred on change of Job? Your EPF account would have become inoperative. Suggest you to submit online request for withdrawal through inoperative portal. EPFO will guide you on this. You can create UAN online by yourself and can visit the concerned EPF office (where you account is being maintained), submit withdrawal form along with Affidavit, copy of PAN card, cancelled cheque and filled Form 15g. Seems like old site link. I’m trying to generate the UAN since couple months and couldn’t succeed…. You may submit your grievance to EPFO..click here..
‘For Citizen’ option is not available in EPFO site. Also i do have my PF number but i left my job in 2013. When asked for UAN from my previous employer they suggest me to get in touch with EPFO. I am not working since 2013. Also my previous mobile is not working now as i shifted the city too. Other than PF number and PAN card number i don’t have any other document with me. Now in this case, how can i get the UAN number? I tried to get in touch with the customer support but of no use. You can submit your request through EPFO’s in-operative helpdesk..
Also, read : How to generate UAN number? UAN does not create in present time, please tell me create uan password. and does not check to Epf balance display. please check. Hi Now “citizen service” site link is not working. Is there any second method to generate UAN. Call to 01122901406 from your regitered mobile number in your previous. you uan number sent to your mobile number. Hello sir.. am Ramesh nagarajan. I leave job 2017 march. I hv PF UAN and also PF NO. How can i get my PF amount. What is the process. Plz tell me the way. Dear Ramesh .. You can withdraw full PF balance after 60 days of being unemployed. Kindly read : EPF new Composite claim form. Hello sir.. am SAURABH PANDEY. I leave job 2016 FEB. I hv PF UAN and also PF NO. How can i get my PF amount. What is the process. Plz tell me the way. Dear SAURABH ..Kindly read: EPF new composite Claim form..
Hi, iam nilesh patil leave in Silvassa DNH, main vaaman engg Ltd contract main kaam karta Hu, muje UAN NO Aur EPF NO mil gaya hai lekin PAASWORD BANANE KA hai UAN NO ka password kaise banate HAI please muje bata sakte HAI. Hi I Am Kishan Kumar have tried to create UAN , iam unable to select industry details from industry drop down on page as no values are there and field is mandatory, please help me. It’s been 5 months. I have not received the UAN no. yet. I have not been intimidated of missing data from my end either. I would like to know how long does it take one to receive UAN no. after applying. my company name is a skl jalan una web page not open please help me sir…………………………. My pf acc. From 2009-13 … not uan create .. my name and f/n in wrong. Pf balance withdrowl any idea ??? While filling up for UAN Registration today, at one place spelling mistake was there, but got registered on mistakened name. How to get rectified the mistaken name? Can you reply asap please? Dear Ravikumar ..Kindly read : UAN helpdesk portal. Hi I have tried to create UAN , iam unable to select industry details from industry drop down on page as no values are there and field is mandatory, please help me. I had PF account no and i did’t have a UAN No .. how can i get my UAN no ,could u help me on this? These sites are very slow, I’m unable to open.This is really annoying to me. Dear Sandeep..EPFO has officially informed that there has been some tech issues with their portals, and may take some more time to get them UP & live. HI , I have my UNA No and PF No but ,I am not able to active my UAN account ,it shows an error that my name and birth date not found in database , can you please help me ? Read: UAN help desk portal for name correction & DOB. i left the organisation it almost 4 month but company does not provide me UAN no they told me contact to prior organisation and correct your UAN no but no response me from last company. Please suggest me the issue what would be the best option for me. Dear Abdul .. You can find your UAN number by visiting UAN helpdesk portal, click here to read more details. I am an ex employee of Tech Mahindra in Pune and completed 3 years. Presently I am with my husband in abroad. I am having PF number, Pan Card and Bank account with me. I am not having Aadhar Card. I need to generate my UAN number. Let me know the procedure for registration. Let me know the link to make online request to get the UAN. Dear Cynthia..Kindly go through the above article. As you do not have Aadhaar number, you may have to submit the Withdrawal forms through your ex-employer only. Kindly contact them. Hi How many days will took to create my First UAN account By my employer? Newly joined a company Its my first company offering PF account. They give me PF account number. Dear mathew ..Kindly contact your employer. It’s been 5 months since i have provided my details to my employer. I have not received the UAN no. yet. I have not been intimidated of missing data from my end either. I would like to know how long does it take one to receive UAN no. after applying. Dear Amit ..Five months is a pretty long-time, kindly follow it up with your employer. Also, use UAN helpdesk portal to check ‘what is my uan?’ (if they have already created one). i had registered to generate the UAN number and got the request number too. Now when i check in UAN status, its showing as UAN generated. How can i find that generated UAN …? Failed to send SMS. Please try after some time. some one help me to resolve this issue. This is sukanya, i have entered all needful information in registration form of online, but i didn’t receive any sms of get authorization pin, it is showing ( Failed to send SMS. Please try after some time.) like this its showing, please let me know that what should i do. My employer has not given the UAN number. The PF number I have received from them are incomplete. Can you please advise how I can find my correct PF number and withdraw my account? Dear Prithvi..Read this article to understand the EPF a/c number format. When I contact them they are making delay and excuses. What is the way to create my UAN in this scenario? You can create UAN number but to link it with PF number, your employer has to submit your employment details to EPFO. Kindly follow it up with your employer. One of my friend’s PF no is 155573. How to create an UAN with this? In his payslip only mentioned this number alone . how to input this number in the UAN portal to get the UAN number? That’s the Member-ID. Kindly read this article: What is Establishment code, how to get it? How to read EPF account number (format)? My name is TENUGU RAJU and my pf a/c no MH/BAN/125333/27****.I want to know my EPF balance.when i am trying to know my EPF balance thera was error reflecting on the screen.the error is Invalid input/member name mismatch I tried differently also but i am unable to know my EPF balance. and one more thing i joined new Organisation on march-2016 with EPF no.RJ/19435/27***.So i want to old pf balance is transfer to new EPF a/c.but i don’t have UAN number also my old organisation was not provide UAN number to me. my base EPF numbers all are other states(one is Maharashtra and second one is Rajasthan) and i am sitting in Nizamabad(Teelangana stste).i can’t do anything for this regard so kindly suggest the right way to me.please do the needful. Kindly check with your new employer if they have generated UAN number for you? If yes, then you can use ‘One Employee – One EPF a/c‘ online facility to consolidate your EPF a/cs. I am Nikita. My employer created my PF account and UAN number also. I got them on my salry slip. But know when I am trying to register online on protal, it shows member ID and UAN mismatch message. either PF or UAN number are wrong. I check UAN status with the given PF, then it is showing no UAN generated. How can I know if PF is correct or UAN? If UAN incorrect, then atlest I can register for new UAN. My employer response for the queries is not fast. What can I do to know if the PF number is mine? You can submit your grievance at UAN helpdesk and you can find out your UAN number. If that is correct then you can check about your EPF number with your employer. My name is vinod. from trivandum(kerala).sir actually 7 years before iam working a advertising company.the company give pf.9 months working that office.but i have pf no.but now not get UAN Number. Dear Vinod..Are you employed now and contributing to EPF scheme? Your old EPF a/c would have become INOPERATIVE. How to generate UAN number online? Dear Santhosh..Kindly go through this article : UAN helpdesk details..
I’m apply my pf on 23th feb’2016. I want to my pf money but not credited pf of my bank a/c. what is problem pf problem.so pls do the matter. Kindly note there were lot of issues with respect to processing of withdrawal requests by the EPFO. This was due to implementation of proposed new rules. But now these rules have been scrapped. Did you apply directly? or through your ex-employer? Suggest to apply for the withdrawal again after checking with your employer/epfo. I have applied to generate a UA number on 4 Apr’16, yet i have not received UA number, usually how many days it takes to generate, Kindly help me with this. Dear Nandini..Suggest you to submit your grievance at UAN heldpesk portal.. I want creat my UNA Number so Pls help me how to creat it. Hi Sreekanth , I am an Employee and i have been allotted PF Account number in my pay slip but PF UAN Number is showing ‘Zero’ ( Is it a problem) if then how I need to generate the PF UAN Number by myself. Dear Deepak..Kindly go through the article. Hi srikanth, I was unable to upload photo and signature in the server on this link, when I try to upload the following msg comes up “CAUTION! CAUTION!! CAUTION!!! It must have been timed out. Refresh the page and fill it up again. Keep the photograph and signatures ready for upload. I am also srikanth.. . Please make me understand regarding PF . 1. With out UAN can we with drawl PF money once I left the company? I am currently working in Tech M past 5+ years. 2 If heard we will get pension on PF after completion of 10 yrs working. If yes then help me with the complete details like how much money will get after 10 yrs ..
1 – Yes, if you stay unemployed for atleast 2 months. 2 – It is EPS, it depends on your salary structure. I have left the Job 3 Years back & doing Consultant work .. Applied for & UAN & recd the # .. Updated the KYC details in the UAN site .. Pl let me know that who will verify the KYC details in UAN since the same has to be verified by the Employer ? Kindly check if your EPF a/c has become in-operative one. Dear Mathpal..I do not have calculator but you can read my article : ‘How is interest on EPF A/c calculated’? could u suggest best personal accident insurance(ex.road accident,snake bit etc) policies(& also permanent disability caused due to accident)for earning & non-earning people? Dear Shivaraj..Kindly read – Best Personal Accident Insurance plans. i am state govt salaried employe 1.can i add my no earning housewife as spouse ? 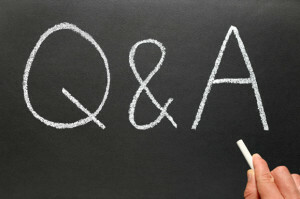 3.wat r diffrent online term insuran companies offer joint life online term? 4.and also offer no earning house wife inclusion as joint term life online? If your spouse is not an earning member of your family, life insurance cover may not be required on her name. Best Online term insurance plans. HDFC Click 2 Protect Plus review. 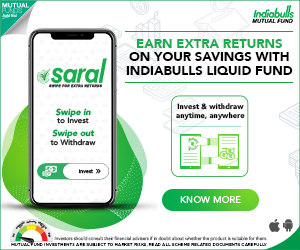 ICICI Pru’s iProtect Smart term plan.